Booklets Printed in Full Color on Premium 70lb Uncoated Text Stock with Saddle Stitch Binding. Printed on 70lb Uncoated Text stock. Available in increments of 25 thru 25,000. 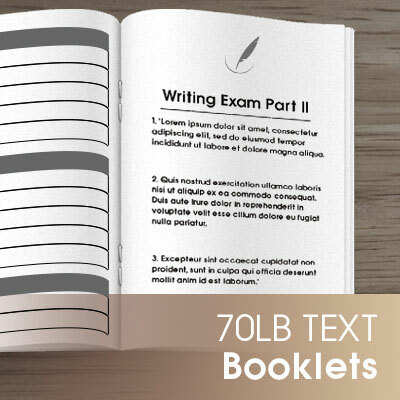 70lb Text Booklets: When you need a little more space to tell your story, consider our 70lb Text Booklets. Your message will be perfectly packaged in 70lb uncoated text stock and printed in full, vibrant color. Finished with a saddle stitch binding, your booklet will be fit for a fairytale. Our 70lb Text Booklets are available with 8-32 pages and in quantities of 250, 500, 1000, 2500, or 5000.